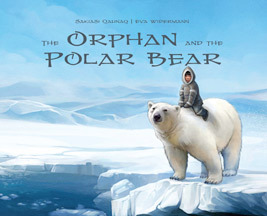 In The Orphan and the Polar Bear, an orphaned boy who is abandoned on the sea ice by a group of cruel hunters is discovered and adopted by a polar bear elder. While living in the polar bear’s village, the orphan learns many lessons about survival, but most importantly, he learns something about himself and his own place in the world. This book—retold by Inuit elder Sakiasi Qaunaq—makes this beautiful traditional tale widely accessible for the first time.